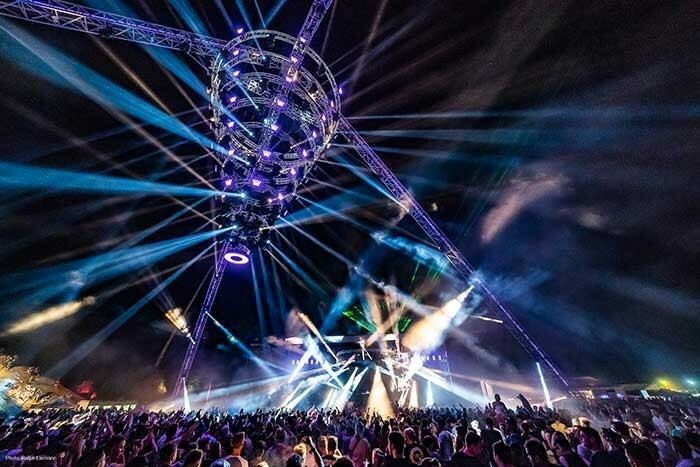 Germany – Under the catch-line ‘All you need to be’, Nature One called its dance-loving audience to the Pydna former rocket base in Hunsrück between 3-5 August. 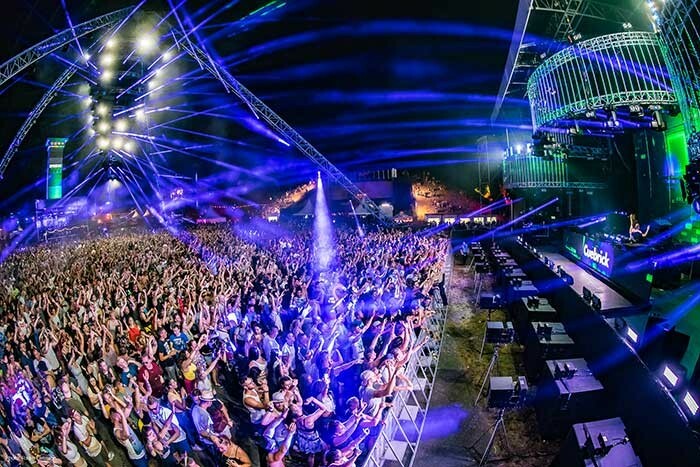 As in previous years, over 50,000 people joined the pilgrimage, engaging in four days and three nights of pure EDM fever, with 350 acts participating on a total of 23 floors. For the largest floor, the Open Air Floor, lighting designer Thomas Gerdon of GERDON design produced the entire visual concept. 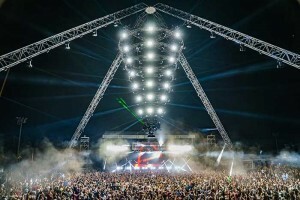 Gerdon, who has been working on various floors of Nature One since 2003, faced a fundamental change this year: for the first time, a conventional stage was used on the Open Air Floor, and for this the designer immediately had the idea of GLP’s new modular KNV LED system of GLP in his mind. However, since the KNV system was not yet on the market at the beginning of August, GLP was able to meet the designer's request with a sufficient quantity of field test units. Thus, Nature One became the first German event in which this modular strobe / blinder / pixel fixture had been used in such large numbers. 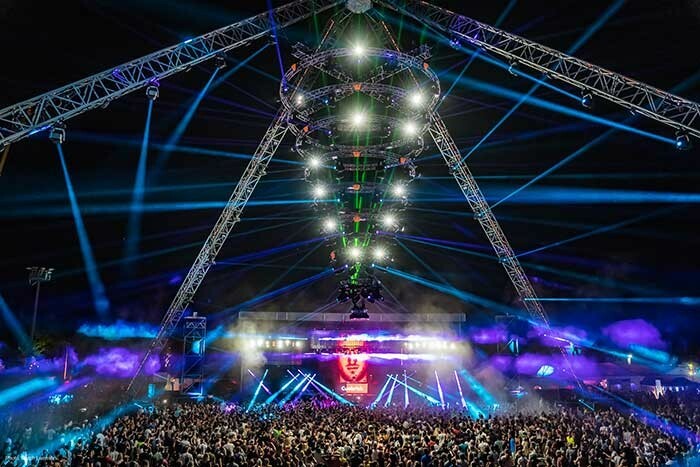 "The presence of a large stage was definitely the most striking visual innovation on the Open Air Floor," confirms Thomas Gerdon. "We absolutely did not want a proscenium 'peep-show’ style stage, which is why we worked a lot with broken-up LED surfaces to create vitality and variability." "We controlled the entire system via Art-Net so that we could access all the fixtures via both the lighting console and the media server,” he said. “The KNV Cube’s RGB LEDs were integrated into the pixel mapping and could be displayed with the video content of the adjacent LED surfaces. Thanks to their pixel pitch, and the way in which the KNVs are addressed, this again made a nice visual transformation of the content possibilities. In turn, we were able to use the RGB LEDs as floodlights and the white light LEDs in the centre of the power pixels as strobes / blinders via the lighting console. At the planning stage, of course, this is more time-consuming in terms of merging these technologies, but in the end it offers completely new possibilities that create an enormous amount of scope for design. In fact it’s completely flexible, everything goes with everything else, and it's great fun." 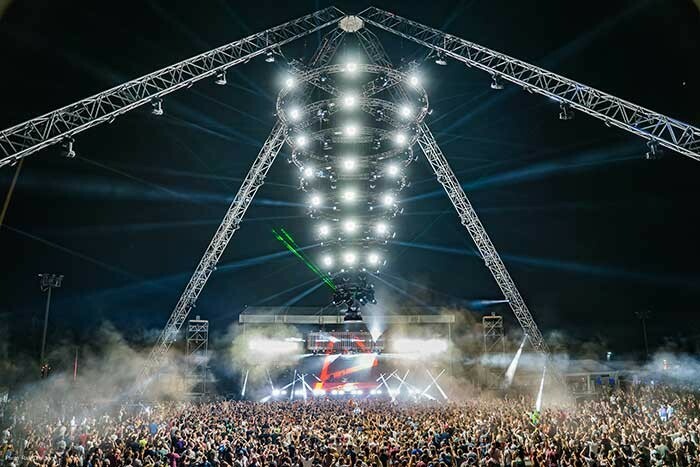 In every nightclub there is lighting suspended over the dance floor, and this year's Open Air Floor once again had a pyramid-shaped truss construction built around a new centre effect. This consisted of eight uniformly hanging, downwardly-tapered traversing circles, to each of which eight KNV Arc and eight moving lights were attached. "The centre effect, with 64 KNV Arc, was the real highlight and supporting design element," adds Thomas Gerdon. Apart from the extremely diverse design options, one feature of the KNV in particular caused quite a stir: its enormous brightness. "The brightness of the KNV modules really stands out. We often test new products that are advertised with very high light output, then ultimately do not look so impressive with the professional look. With the KNV this is really different. You turn it on and these hyper-bright power white LEDs are just evil and at first scare even a veteran like me,” chuckles Gerdon. Consequently, the KNV found much favour with the lighting crew and the guest lighting designers. "The reaction from all local technicians was consistently positive. At Nature One everything is live, and in this very spontaneous way of working, the KNV has been great, since the LEDs respond in real time." Thomas Gerdon and his team really enjoyed trialling the KNV under live conditions. "You cannot properly judge a device under test conditions in a hall. After a real field test, like we did with GLP at Nature One, there are no more questions to be asked. You know what the device can do and how to handle it. We worked very constructively with GLP and were able to provide important feedback in the run-up to production of the series. It was a real win-win situation and there were no failures. We installed the modules, turned them on and had fun. Although we did not have any production models available, there was no stress, thanks to its water resistance, not even in heavy rain,” explains Gerdon. When asked in which situations he could imagine the KNV being used, he laughingly replies: "Ask me where I can not imagine it! I could envisage the KNV as a backdrop on a TV show stage. I basically want them at every festival—no matter whether it is techno or rock 'n' roll. Or I can imagine it at an auto show, with the KNV Arc, set up as a ring, at two meters over a car, that would be very chic. I can use it to build shapes, numbers, letters. I just like the KNV very much. The device really fits everywhere! " schoko pro GmbH from Wiesbaden was responsible for the implementation as technical service provider. Working alongside Thomas Gerdon were Rando Lorenz (lighting director and principal lighting operator), Marc Cloutier (second lighting operator), Marek Papke (principal media server operator), Markus Neubauer (second media server operator) and on-site laser operation from Jan Eiserloh of Laserfabrik.